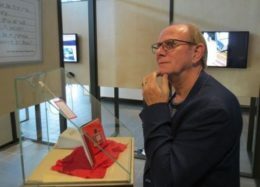 On 28 June the exposition Paper Magic opened in the COMM museum in The Hague (NL). Here you can see, hear, touch and smell unexpected paper innovations. The items on display demonstrate that paper does have a future in this digital world. You’ll see interactive paper producing sound, such as posters (on the right) and a piano book, created by Novalia. This technology can be fun and useful in, for example, advertising and education. It’s bringing paper to life! Visitors are kindly invited to touch and play. 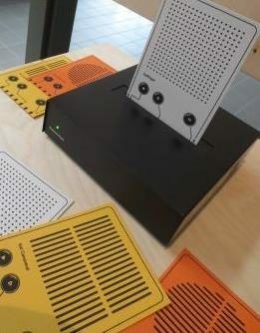 The Postcard Player on the left (by Uniform, UK) reintroduces a tactile connection between music and music lover. 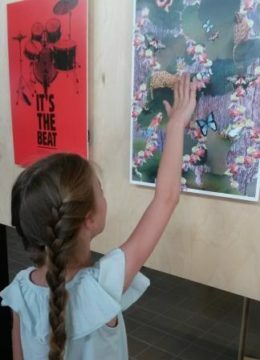 Each postcard is printed with carbon-based conductive ink, which uses capacitive touch to make the listener part of the music playing process. Paper also tells its own story. Because paper pulp can be mixed with various fibres, paper creates its own identity. You’ll see, for example, paper products made from aquatic plants, tomato stems and cacao beans. Anne van Eijsden, founder On the Rocks, introduced her notebooks made from stone paper. She discussed with the audience the emotions when writing on paper and the ongoing reseach related to sustainability. The exposition runs until December 2018. 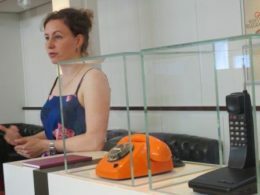 The aim of the COMM museum is to explore the impact of communication in daily life.